Two wooden fishing vessels rest on the shore of Gazi Bay, Kenya. 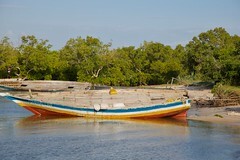 In the background can be seen a group of mangroves. This photo was taken during a site visit for the GEF Blue Forest project www.gefblueforests.org.